From now until 11:59 PM EDT on Friday, July 29, save big on the FreePBX Phone System 500! We have a limited quantity of new and open-box units available first-come, first-served while supplies last. Buy now to take advantage of this special promotion and save up to 70% off MSRP! The FreePBX Phone System 500 is purpose built, high performance, and rigorously tested to work with FreePBX - the world’s most widely deployed PBX platform. 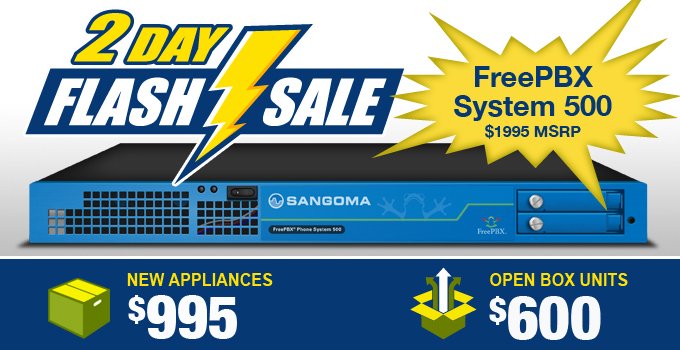 This appliance is part of Sangoma’s lineup of officially supported hardware solutions for FreePBX. Looking for a High Availability (HA) solution? Now is your chance to get two FreePBX 500 appliances for less than the price of one. Add an HA license to both deployments, complete HA setup and configuration in the FreePBX GUI, and you'll be able to enjoy the peace of mind of automatic mirroring and failover! On behalf of the FreePBX project team, thanks for your continued support. We hope you’ll visit the Sangoma Portal Store to get in on the savings.